Osmosis: Tubular secretion of PAH. (2019, April 20). Retrieved from (https://www.osmosis.org/learn/Tubular_secretion_of_PAH). Para-aminohippuric acid is an organic acid that is freely filtered into Bowman’s space and is also secreted from peritubular capillaries into the tubular fluid. It is not reabsorbed so it is commonly used to estimate renal plasma flow. The para-aminohippuric acid transporters in the proximal tubule cells are inhibited by (medication) . If we take a cross-section of the kidney, there are two main parts, the outer cortex and the inner medulla. If we zoom in, there are millions of tiny functional units called nephrons which go from the outer cortex down into the medulla and back out into the cortex again. These nephrons perform the major function of the kidney, which is to clear harmful substances from the body by filtering the blood. Each nephron is made up of the glomerulus, or a tiny clump of capillaries, where blood filtration begins. Interestingly, once the blood leaves these glomeruli it does not enter into venules. Instead the glomerulus funnels blood into efferent arterioles which divide into capillaries a second time. These peritubular capillaries then reunite and at that point the blood enters venules and eventually drains back into the venous system. Now, when blood gets filtered, some fluid remains in the glomerulus, and some fluid goes into the renal tubule. The renal tubule is a structure with several segments: the proximal convoluted tubule, the U- shaped loop of Henle with a descending and ascending limb and the distal convoluted tubule, which winds and twists back up again, before emptying into the collecting duct, which collects the final urine. Now, zooming in on this nephron’s tubule, each one’s lined by brush border cells which have two surfaces. One is the apical surface which faces the tubular lumen and is lined with microvilli, which are tiny little projections that increase the cell’s surface area to help with solute reabsorption. The other is the basolateral surface, which faces the peritubular capillaries, which run alongside the nephron. Alright, now, one substance that’s filtered out of the glomerulus and into the tubule is para-aminohippuric acid, or PAH for short. Actually, PAH is an organic acid, and about 90% is bound to plasma proteins. So, really, only the unbound 10% can pass through the glomerular capillaries. Essentially, the higher the unbound PAH concentration, the more PAH will get filtered. If we wanted to illustrate this in a graph, with the unbound PAH concentration in the blood on the x axis and the PAH filtered on the y axis, we would see that as the unbound concentration of PAH increases, the filtered load of it is also going to increase in a linear fashion. 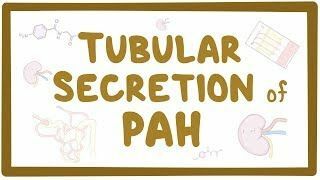 Now, in the renal tubule, reabsorption, is when something moves from the renal tubular back into the blood, and actually no PAH is reabsorbed. Secretion on the other hand, is when something from the blood moves into the renal tubule. And in fact, an additional bit of PAH is secreted from the peritubular capillary blood into tubular fluid. To accomplish this, the basolateral membrane of the tubular cells has a special type of carrier protein that transports PAH, as well as other organic anions. So, now let’s add the PAH secreted to the graph, also on the y axis. At first, the higher the PAH concentration in the blood, the more PAH will get secreted into the tubule. But there’s only a limited number of carrier proteins available on those tubular cells, which means that at some point they’re working at full capacity and no additional PAH will allow them to work any faster. This is known as the Tm or transport maximum. After this point, the secretion of PAH stays constant even with increasing PAH concentration. Finally, we can add PAH excreted in the urine to the graph, and excretion in the urine is the sum of the filtered PAH plus the secreted PAH. In our graph, below Tm, small increases in plasma PAH concentration give rise to steep increases in PAH excretion, since both filtration and secretion are rising along. Above Tm, though, secretion gets saturated, so with increases in plasma PAH concentration only the filtration component increases, and excretion rises less sharply and becomes parallel to the filtration curve.